What is the best solution for insulating your NE Home's Crawl Space? A properly insulated and sealed crawlspace is one of the fundamental elements of a comfortable, healthy home. Crawlspaces have long been insulated with fiberglass batt insulation, but modern building science reveals the downsides of that practice. Ideally, crawlspaces should prevent air from infiltrating a home, so as to reduce the occurrence of drafts and the presence of allergens. How many times have you seen round/oval vents penetrating from the crawl space into the house through rectangular holes? This situation is cause for great concern. We already know that fiberglass batts cannot control or prevent air/moisture movement and infiltration. That being the case, even if your crawl space is “properly” insulated with batts, they will not prevent cold air, warm air, contaminated from entering the living space of your home. If the crawl space in your home is not fully sealed from you’re your home, there is a strong likelihood that contaminated air, earth gases, mold, rodents, and more can penetrate your living space. Spray foam insulation installed between your floor joists in your crawl space is the only material that will create an effective thermal barrier from obstructions such as wiring and plumbing, ductwork, and narrow or wide joist spacing. Batts are often compressed during installation due to the use of wire insulation hangers. Open web floor trusses create additional problems in that the open webs create pathways for air to move around the batts. During the summer, warm humid air can flow around the batts and create condensation, mold and decay problems in the floor system. Open web floor trusses are virtually impossible to adequately insulate with batts. Closed-cell spray foam will also serve as an effective moisture barrier between the ground and homes subfloor surface. It will also prevent “stack effect” air/moisture movement into the homes walls and upward into the homes attic space, which can cause even more problems. Spray foam circumvents floor insulation problems through its ability to completely fill voids and open spaces. Areas around wiring and plumbing as well as open webs of floor trusses can be completely filled, resulting in a complete, essentially uniform thermal barrier on the floor. Spray foam insulation in the crawl space is a superior insulation product that overcomes several disadvantages of other insulation products. Spray foam can provide a more uniform, consistent thermal barrier as well as provide stack effect / air flow retarding functions. Spray foam is the fastest growing insulation material on the market because it lowers energy bills and improves occupant comfort. 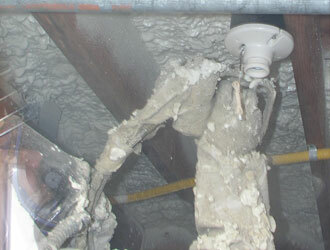 Our experienced NE contractors install foam insulation in and around the state of Nebraska. Find out more about getting SPF installed in your home here. Nebraska Foam Insulation seals and insulates your existing home saving you money, making you more comfortable and saving energy. Our trained NE insulation contractors can usually retrofit your home with foam insulation in just a day.